I’m spending more time building, what I’ve dubbed the CityGrid Local, Mobile, Social Stack, a list of APIs, platforms and tools that you can use in your local-mobile applications. With the latest move by Foursquare to join the OpenStreetMaps movement, I’m focused on finding the best mapping tools for the CityGrid Local, Mobile, Social Stack. First on my list of alternative mapping solutions is Verizon Mapkit API, which provides location-based services that include maps, search, traffic and static directions. 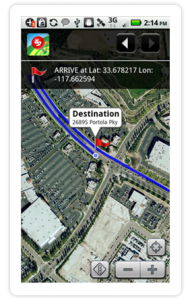 The Verizon Mapkit API is centered on a map object that provides a tile-based solution supporting multiple layers such road map/satellite/hybrid, traffic, and routes--with built-in controls for standard map operations such as panning and zooming using the host device’s native gestures. The Verizon Mapkit API does not have a web API currently, but does support native application development on Android, iOS, Blackberry and Brew MP platforms. At first glance you may think the mapping solution is just for Verizon devices, but it can be used across multiple platforms. The Verizon Mapkit API is a perfect addition to the CityGrid Local, Mobile, Social Stack. They offer a robust mapping platform that native mobile apps can take advantage of. The Mapkit API is part of the Verizon NavBuilder Inside LBS SDK, which comes with other APIs and tools I will be adding to the CityGrid Local, Mobile, Social Stack in future blog posts.